Disney resort hotels all have incredible pools… where should you begin? 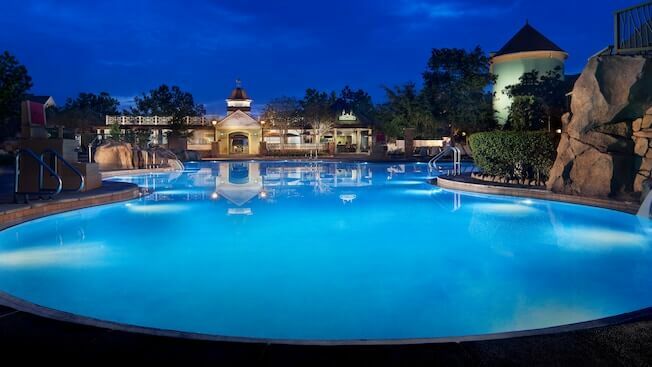 We’ve got the list of best Disney pools for kids! It’s no secret that some of our favorite times on Disney vacations have been spent away from the hustle and bustle of the Disney parks. 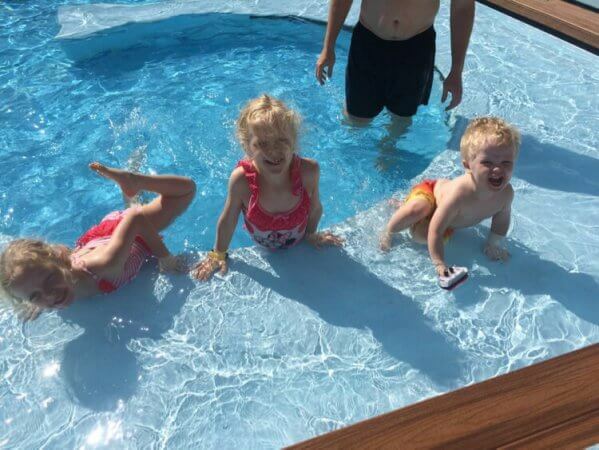 And it’s no secret that for most kids – mine included – any hotel with a swimming pool is the best hotel they’ve ever been in… at least for the moment. So it’s true, that after a day at the most magical placed on earth, my family would be content to head back to just about any old clean (preferably heated) pool. But you know Disney doesn’t do “any old” anything very well. So unsurprisingly, the swimming pool at your Disney resort hotel – usually pools, plural, if we’re honest – is going to be cool. 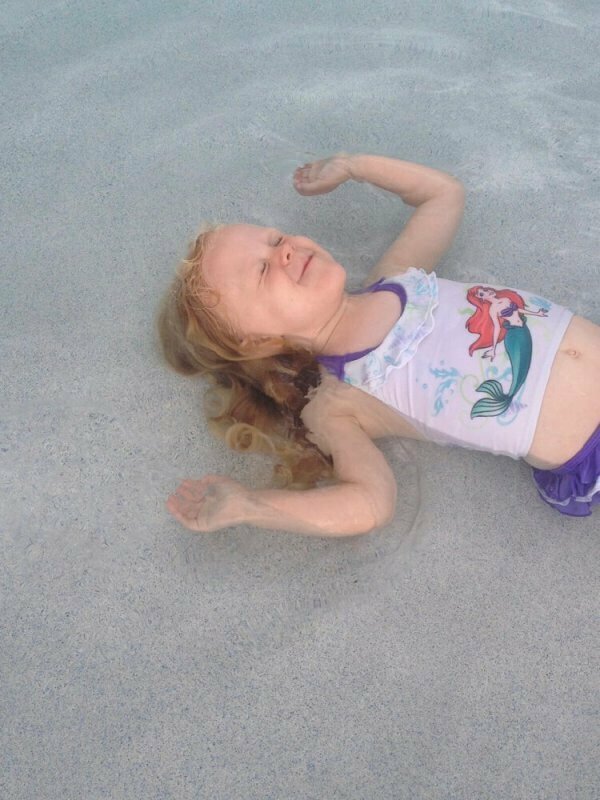 It doesn’t matter if you’re staying in the least expensive Value room or the most expensive Deluxe, you and your kiddos won’t have to swim in a boring rectangular hole in the ground. The reality is, some pools are definitely better than others – even if it’s a matter of preference. Below, we’ve asked my kids for their favorite Disney pools. They’re in descending order, sort of, but really you can’t go wrong with any of these. A resort that gets sort of a bad rap among some, we are huge fans of what was the first DVC resort we ever called home. This resort even boasts two feature pools, in addition to “quiet pools” in each of the resort neighborhoods. The original feature pool area, High Rock Spring Pool, features a water slide slide with beautiful rock work, plenty of space to swim, and a great little splash area for kids. Who knew?! 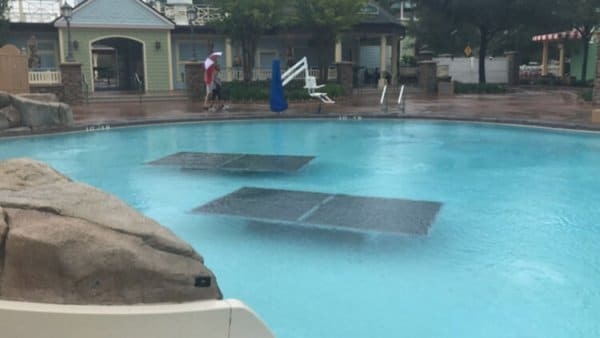 The pools can double as a “don’t let the furniture blow away during Hurricane Matthew” bunker. The Paddock Pool, opened as a second feature pool, has a second large water slide, zero0depthh entry, and a horseshoe-shaped hot tub. This are has 2 kid-friendly water slides, too. 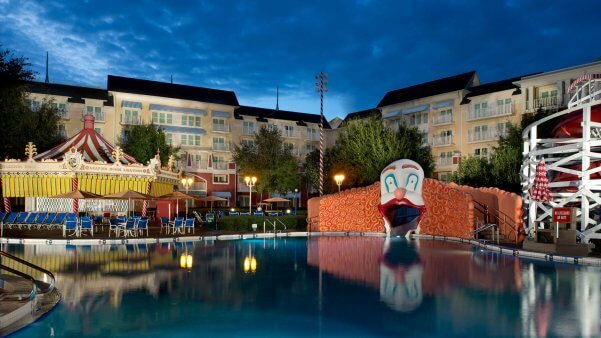 Harkening back to 1920s boardwalks, the pool has elephant statues that spray passers by, a bar shaped like a carousel, and a giant clown face as the base of the slide. The Grand Floridian has a few great pools, but the kids’ favorite choice is the whimsical play area themed to Alice in Wonderland. The Mad Hatter’s hate dumps water when it fills up, and the little teacups below are so much fun to watch. The coolest thing about the pool area at Wilderness Lodge is that a little creek (“Copper Creek”, the namesake for the new DVC resort area and overall theme update, runs through from the lobby to the pool, and on to Geyser Point. Themed to a Spanish fortress, this pool is unique and super fun. Cannons spray water, a shipwreck becomes a play area for kids, and two waterslides provide hours of entertainment for kids. The Uzima Springs pool at Disney’s Animal Kingdom Lodge has long been touted as one of the coolest. It was one of the first zero-entry pools on property, and is still one of the largest at 11,000 square feet. Like most pools at Deluxe resorts (and many others), it also has a fun water slide. 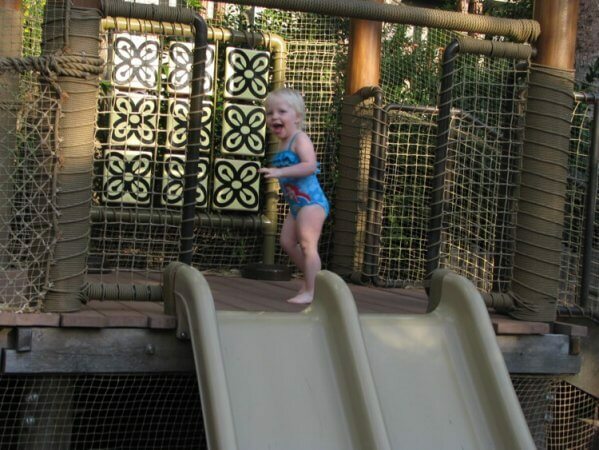 Our favorite place to play though, during a stay at Animal Kingdom Lodge, is Samawati Springs Pool and Uwanja Camp play area at Kidani Village. 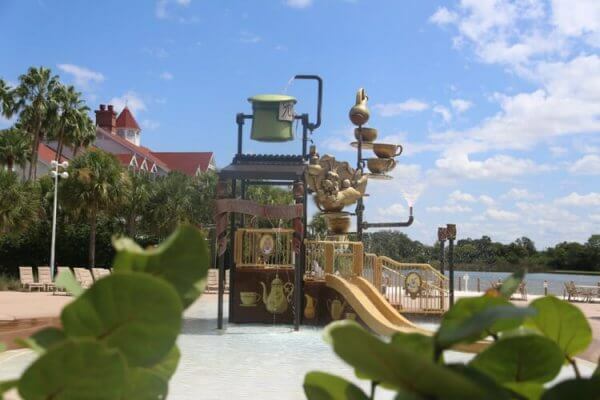 This is easily our favorite splash/water play area on property, with three large, distinct areas to play. The Departure Zone, Observation Station, and Base Camp provide different experiences for kids of varying ages, though all of mine have had fun in any or all of them when we’ve visited. 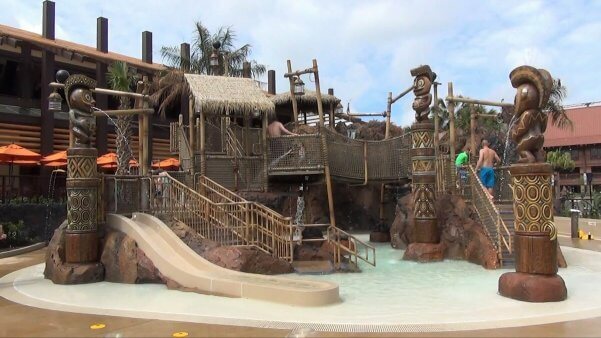 When the Polynesian Village Resort got a major overhaul a few years ago, they vastly improved the pool area – while preserving the things guests had loved about the Lava Pool for years. We’ve already shared what we love about this pool and play area, but here’s the overview. Beautiful lava rock features make the place a sight to behold. 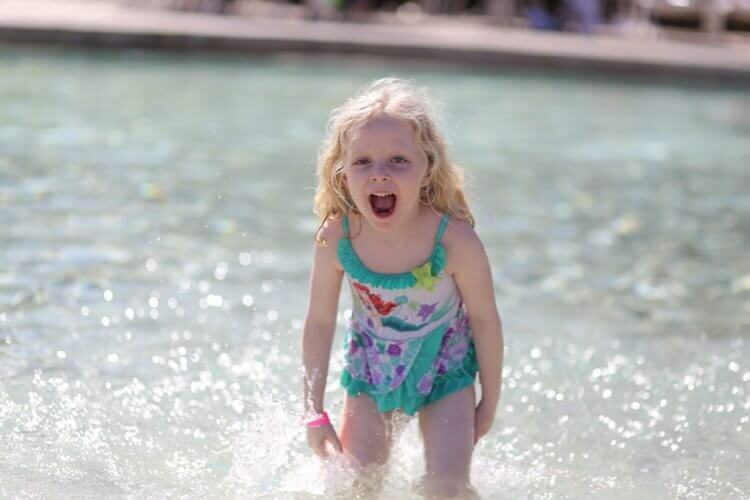 Water slides and splash areas give kids of all ages something to do. There’s an infinity hot tub, and a spectacular view to look at from said hot tub. 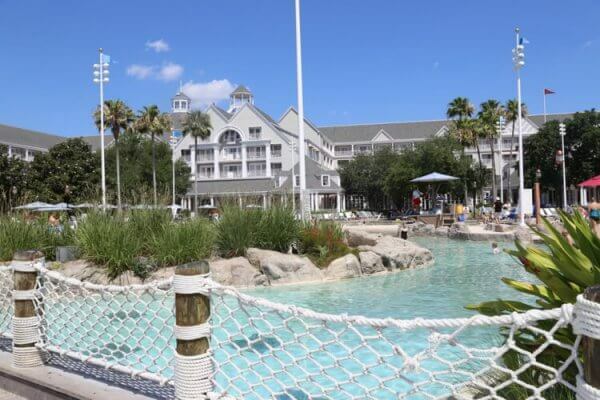 Time and again, we’ve sung the praises of Stormalong Bay, the “pool” shared by Disney’s Yacth Club and Beach Club resorts. I use quotation marks for the word pool, because it’s really a mini-water park of its own. There’s a lazy river, a shipwreck water slide, a whirlpool, a beach play area, a sand bottom section, and more. To call it a pool sells it insanely short. Truthfully, the first pool one of my kids said was the Donald Pool on board any of the Disney Cruise ships. While Nemo’s Reef is fun (and one of my daughters is legitimately disappointed she has aged out of it), we decided that the pools on the ships are most assuredly not the best pools anywhere. The reason they are so highly regarded, we determined, is because they’ve been plopped directly in the middle of our favorite kind of vacation. We swim in them while sailing to amazing destinations, while watching movies and trivia and stage shows, before and after hanging out with new Cruise Staff friends. They make us extremely happy, but they aren’t great pools. And they’re insanely small and crowded. This pool is literally, for the most part, a giant rectangular hole in the ground. What makes it special, though (aside from being truly massive), is that no matter where yo are, you can hear music playing via an underwater speaker system. I’m not sure why this isn’t more prevalent, but it serves to make this pool something unique. 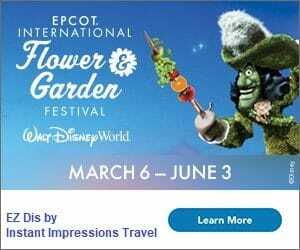 You may have noticed that there are no Disneyland resort pools on this list. I’ve heard great things about the Howard Johnson splash area (a Disneyland Good Neighbor hotel), and the pool area at the Grand Californian is stunning. That said, the kids don’t have any recollection of having ever stayed there, and the pools they remember at Paradise Pier and other good neighborhood hotels are nothing to write home about. The Paradise Pier pool does have a moderate sized water slide, but it was also freezing – so it didn’t make the list. Ok, but what about Aulani? Honestly? 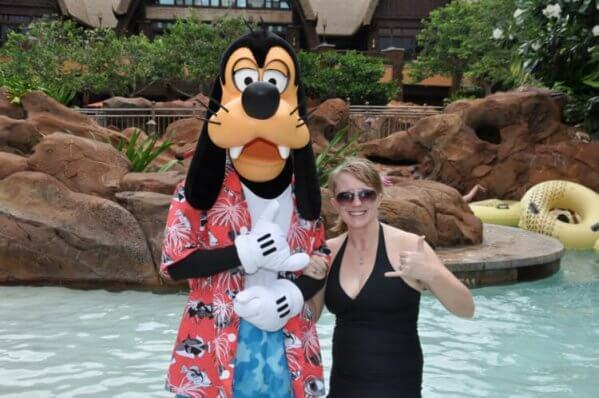 I said all kinds of nice things about how “you can’t go wrong”, and the list is only “sort of in order”… but there’s not a pool on a Disney property anywhere, in our opinion, that holds a candle to the entire water-filled grounds of Aulani. A lazy river, two incredible water slides, multiple infinity hot tubs, multiple splash/spraygrounds and playgrounds… the Waikolohe Valley pool area is basically a waterpark. Between the resort towers and the Pacific Ocean, you’ll find the Waikolohe (family) Pool & Waikolohe Stream, Ka Make Grotto (family) pool, Keiki Cove Splash Zone, Wailana (adult) Pool, and almost a dozen whirlpool spas. There’s also the Rainbow Reef snorkel area, Menehune bridge playground, and all kinds of other surprises hidden around every turn. So now I want to know… what’s YOUR favorite Disney pool?